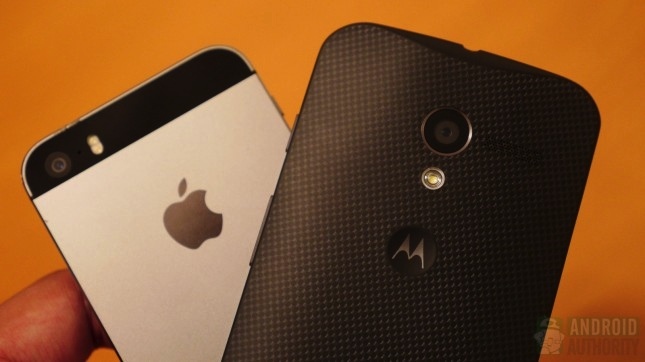 iPhone 5S vs Android: Is Apple Innovating Now? Specs are just words, so much marketing. What ultimately matters in the iPhone 5s vs Android battle for dominance is performance and, just as importantly, what really works. Here is a focussed look at the numbers and ineffibles. 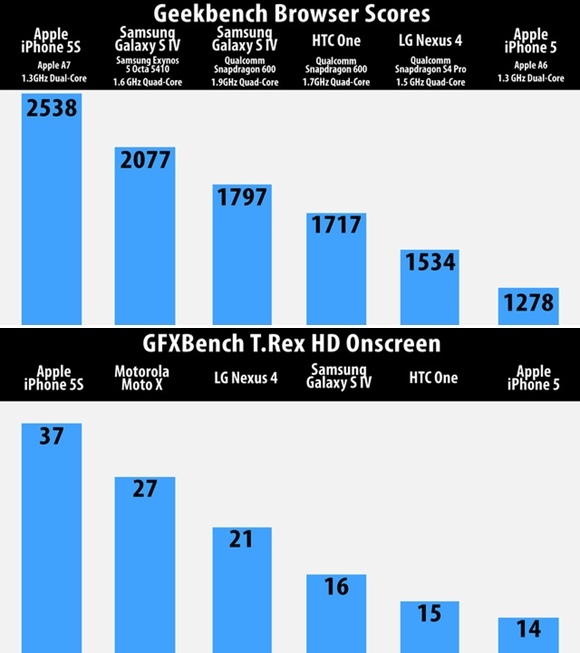 When it comes performance, the iPhone 5s reigns supreme in both browser performance and synthetic benchmarks. In fact, Apple’s 64-bit native A7 processor is almost as fast as Intel’s entry-level Core 2 Duo of 2010. Of course, it bears mentioning that the unreleased Nexus 5 matches the iPhone 5S in a single benchmark, but more benchmarks are coming and we’ll see how that turns out. And, is that result actually equal? The Nexus 5 uses a quad-core chip and 2GB RAM, which is double the processor cores and double the memory of the iPhone 5S. Moreover, Android isn’t optimized for quad-core, meaning there’s a lot of (pointless?) overkill just to pull even with Apple. Additionally, the iPhone 5s’ 64-bit A7 processor is vastly more efficient running a more efficient and secure iOS 7, something Android (a.k.a. sort of Java running in pseudo emulation) won’t be able to match for at least a year. 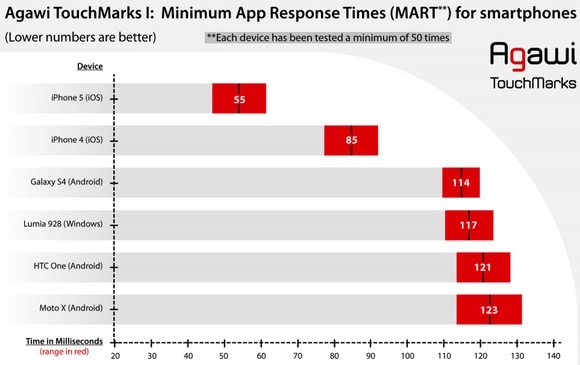 Which feeds neatly into visibly superior iPhone touchscreen latency and app response time — you can see it with you eyes and, now, the data proves it, as well. Then there’s iOS 7 adoption, which currently stands at about 65 percent of the installed iOS base. This provides developers with a target audience of hundreds of millions of devices already running the newest version of Apple’s mobile operating system. This gives devs a vast target audience that spends freely on apps and services — improved graphics, better physics, tighter security and more money. Android Jellybean has been available for more than a year and still hasn’t hit 50 percent, which is embarrassing. So, if you buy anything other than an iPhone are you demented or dumb? No. iPhones are often more expensive, especially when looking at the upfront cost. Whereas the cheapest new iPhone ($99) with plan goes for about $70 (i.e. Straight Talk) a month, there are scores of “git ‘er done” Android devices for less. And, then there’s the rain forest of larger and niche Android devices. Hundreds of millions of Apple fans prefer “it just works,” but that doesn’t diminish Android’s “you can make it work” appeal in just about every shape, size, color, configuration and feature set imaginable. For Android fans trying to make the case that an Android whatever is faster and delivers better performance, don’t go there — specs don’t matter. Apple is innovating, big time. However, specs do come into play when finding the specific device that fits individual use cases and budgets.